The selection of an appropriate vision for the company is becoming an increasingly important issue in the world today where uncertain corporate visions are constantly being changed. Marketing techniques and strategies may adapt to changes over time, but a company’s vision must remain firm. Hebronstar’s consultants assist the client firm’s managers in analyzing prevalent issues and in forming and realizing new ideas. This is the process in which diverse strategies and initiatives are developed through the thorough analysis of factors both external and internal that affect the market and of the entry of competitors into the market. 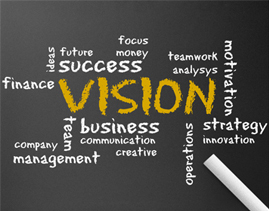 A 10 year vision is established for the company. business channels, as well as many other factors is conducted for the successful foreign development of the company. Suggestions are made as to the necessary improvements for instilling a synergetic company atmosphere and effective work mechanisms.